Since the beginning of the conflict in eastern Ukraine there have been many demonstrations in support of civilians and calling for an end to military activity. RIR reports on the most memorable peaceful demonstrations that have taken place in Russia lately. In the last few months, as the war between government troops and pro-autonomy rebels in Ukraine’s Donbass region has escalated, a growing number of Russian citizens have reacted to what they see as unacceptable and tragic events by organizing peaceful protests against the conflict, from online demonstrations to lighting candles and even weaving rugs. RIR reports on a number of these peaceful demonstrations and how society is participating. The Novaya Gazeta newspaper, the Kushner production agency, the Cultprostir internet platform and the BeTV Ukraine internet TV channel held a New Year's anti-war demonstration online called "Greetings from There to Here." Russian and Ukrainian musicians recorded their greetings, wished their colleagues and listeners a Happy New Year and spoke about peace, all accompanied by a video. In the space of two weeks 36 performers participated in the demonstration, including Russian anti-establishment rock musician Yury Shevchuk and Ukraine’s Oleg Skripka. A large demonstration in support of civilians in the Donbass was held recently in the Urals city of Yekaterinburg, 1,200 miles east of Moscow. 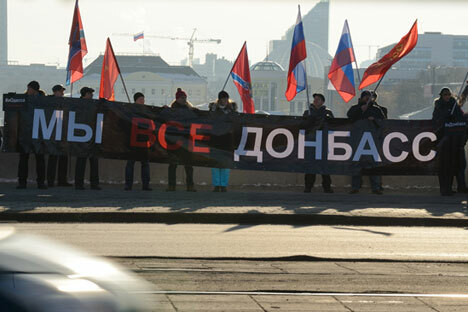 On Jan. 31 about 200 people protested in the center of the city against the escalation of the Ukrainian conflict. Several weeks earlier, an event had been organized on the internet in which, instead of holding banners, social network users photographed themselves holding signs reading, "I'm the Donbass," "I'm Gorlovka," (a town in the Donetsk Region) "I'm Vanya." The idea of the demonstration echoed that of the rallies held worldwide after the Charlie Hebdo terrorist acts in France, in which the slogan "I'm Charlie" gained global popularity. Every day at the same time, no matter where they are, participants of the "Flame of Irene" demonstration light candles in memory of the victims of the military conflict in Ukraine. The perpetual demonstration, named after the Greek goddess of peace Irene, began on Jan. 1, 2015, and anyone who wishes can join it. This is a demonstration for ordinary people, for those who are tired of politics," says the "Flame of Irene" web page. Darina Zabludovskaya, one of the demonstration's organizers, told RIR that she thinks "Flames of Irene" has the potential to reduce the level of aggression in society. "A demonstration of care with the help of lighting candles is the creation of a new type of polemics. It is important to stop the war in peoples' minds," she said. Events supporting "Flames of Irene" are taking place not only in Russian and Ukrainian towns, but also worldwide. "Flames of Irene gives me hope. When hundreds of people in dozens of towns support the idea of peace, this is really magical," said Zabludovskaya. Responding to the call of the International Cultural Forum, needlewomen from 30 towns in Russia, Ukraine and Belarus sent their handmade bands to St. Petersburg, where they were united in one long "rug of peace." The meaning of the demonstration is linked to the ancient Slavic tradition of women coming together in times of trouble and spending a day in silence weaving a cloth or a rushnyk, thinking about how to save their clan. Then the fruits of their sleepless labor would be taken to all the houses and burned. The finished woven rug was exhibited at a local cultural center in St. Petersburg in December 2014, and the demonstrators hope to show it in various Russian cities. Denis Volkov, a sociologist from the Levada Center, told RIR that usually people come together in groups to solve their most critical problems, and few people really think about the common good – hence the limited scope of anti-war demonstrations. "Now, during a time when a part of Russian society is being mobilized against the West and when the country is experiencing an economic crisis, there will doubtfully be demonstrations aimed at gathering the support of a large number of people," said Volkov. Volkov believes that future demonstrations may see the participation of tens of thousands. "During the peaceful demonstrations in 2011-2012 a significant part of the population saw that such events can be held without aggression, that respectable people participated in them," said Volkov. "This was an important experience."